Yes - I know that Halloween is not an Australian tradition but I think that it is a bit of fun. I have just bought a cute little vampire cape for my daughter to wear tomorrow. I have also bought some lollies that I will put into little lolly bags. My daughter loves waiting for the 'trick-or treaters' to knock on the door so that she can hand them some little treats. She is so sweet! I'd love to be able to make these gorgeous treat by Donna Hay. The gingerbread biscuits look so cute! 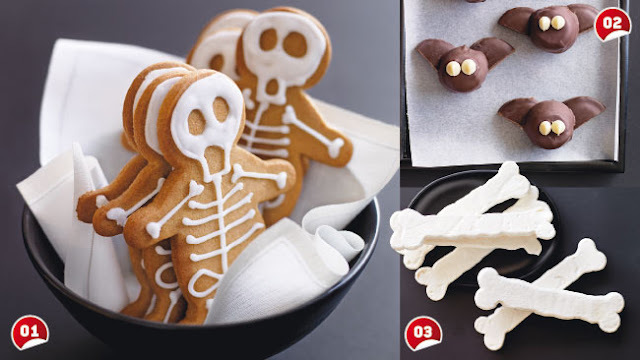 Click here for a recipe for the cute skeleton biscuits. 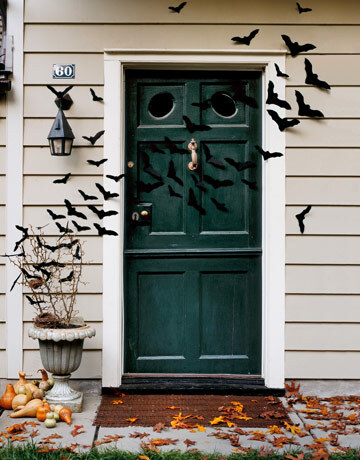 If I had time I would love to decorate my front door so that the local kids felt comfortable knocking on our door for a treat. I love this image that I found on Shannon Eileen's Happiness Is blog.